The Department of Business Studies (DBS) offers undergraduate programs in Business Studies with the emphasis in Accounting, Management, Information Technology, and Applied Economics. It also offers postgraduate programs including Master of Philosophy in Information Technology and an Executive Master's Degree program in Business Administration (EMBA). DBS is in the process of offering PhD studies. There are over 600 students and 30 full-time faculty members of different nationalities in the department. Computer facilities are available within the department and the university. Save the Chidlren PNG is looking for elearning Team Leader. 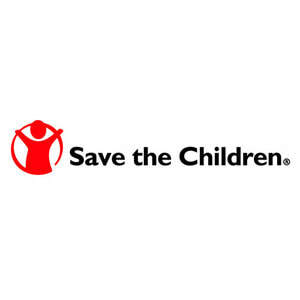 Save the Children has been supporting communities in PNG since 1978, working across all regions of the country. We're committed to be a platform for transformative and lasting change for children, their families and their communities. Western eLearning is an exciting new education project that focuses on improving learning outcomes for children aged 4-8 through improved school readiness, enhanced quality of teaching in literacy and numeracy and a focus on school completion for girls and children with disabilities. We are building a team in the Western Province and seek you to be the e-Learning Team Leader. ​The results of the Education Vacancy, Gazette, Volume 41, No 1 . dated Friday 29th June, 2018 (Confirmation Gazette) is now uploaded and can be accessed online on the links below. All hard copies (Confirmation booklets by province ) were dispersed on the 26th of November to all provinces, Secondary school inspectors, TSC regional officers , Regional Directors Inspections and PEA`s. All provinces (appointment officers ) must now finalize their 2019 staffing lists. All Teachers who applied for positions must be given notices to advise of the results of their applications. National Institution results will be available before the end of this week. Reporting to the Manager Safety & Quality, the primary responsibility for this position will be to coordinate all safety and quality inductions, refresher and specialised training under the SQM Group department for Company. Cheshire disAbility Services PNG, is a leading Disability Service Provider Organization in PNG with programs in NCD and Central Province, Milne Bay and Autonomous Region of Bougainville. Cheshire aims to make a positive difference to the lives of People with Disabilities, their families and care givers, by creating Opportunities for Inclusion, Participation and an Environment in which they are treated with dignity and respect. 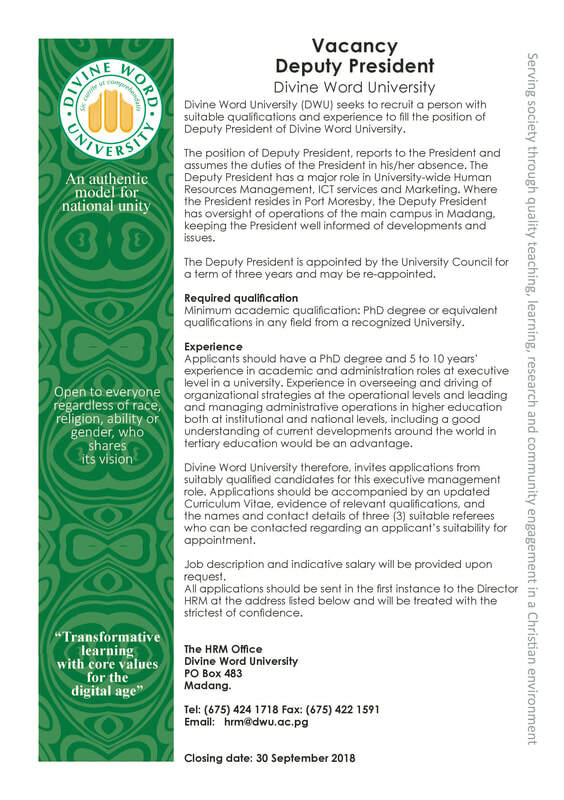 Papua New Guinea's Divine University in Madang is looking for experienced individuals who can fill the position of deputy President. The Education Department has announced Teaching jobs and vacancies around the country. Follow the links below to access the advertised positions. The Vacancies are arranged in regions. ​Join CARE International in PNG and be part of an organisation that serves the needs of Papua New Guineans living in remote PNG. 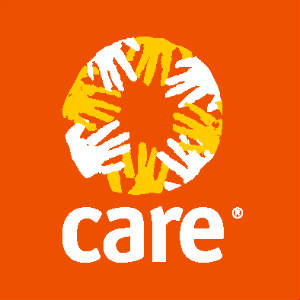 CARE is an international development and humanitarian aid organisation fighting global poverty, with a special focus on working with women and girls to bring lasting change to their communities. CARE works with communities to help overcome poverty by supporting development efforts and providing emergency assistance. We believe supporting women and girls is one of the most effective ways to create sustainable outcomes in poor communities.